Heat oven to 400°F. Make pie crust as directed on box for one-crust baked shell using 9-inch glass pie pan. DO NOT PRICK CRUST. Partially bake shell 7 minutes. Remove from oven; immediately press bubbles down with back of spoon. Reduce oven temperature to 350°F. Meanwhile, in 10-inch skillet, cook ground beef, onion and bell pepper over medium-high heat, stirring frequently, until beef is thoroughly cooked; drain. Stir in zucchini. Cook over medium heat 2 to 3 minutes, stirring frequently, until zucchini is softened. Remove from heat; stir in flour and pepper. 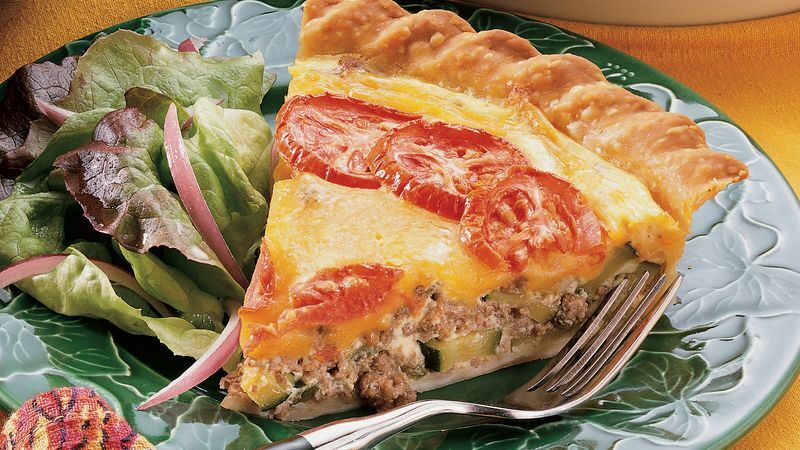 Layer beef mixture, cheese and tomatoes in partially baked shell. In small bowl, beat eggs and mustard until well blended. Beat in half-and-half and salt until smooth. Pour over mixture in shell. Bake at 350°F 40 to 45 minutes or until knife inserted in center comes out clean. Let stand 10 minutes before serving. Cut into wedges. Italian plum tomatoes are small, oval tomatoes with a firm texture and intense flavor; they can be red or yellow.